On this page you’re going to find my honest review of Mark Ling’s AffiloJetpack 2.0 product. As one of the priciest affiliate marketing training products out there, I want to make sure you have a full understanding of the product before you drop any cash on it. Please be aware this is an honest, up-front review … if you’re expecting 500 words of “this is the coolest thing ever, buy, buy BUY!” then you’ll be sorely disappointed. I’m here to shed light on the pros and cons of the affiliate training product du jour (as the French would say … or maybe they wouldn’t – it’s been a long time since I last practiced). 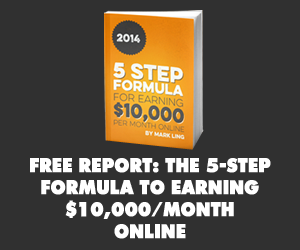 Mark Ling and his team have a sound reputation for producing quality products in the affiliate/internet marketing niche. Some of his other products are AffiloBlueprint – which has gone through a few versions now – Traffic Travis, and SaleHoo. But is Mark’s most premium product worth the high price of admission? Most importantly, will it help you to make more income as an affiliate marketer? NB – I will have a full video review – around one hour in length – available soon. I will embed it in this blog post as soon as it’s available. In the video I will show you around the AffiloJetpack 2.0 members area, and actually go through the process of setting up a site using the automated site building process. Also, make sure you check out and bookmark the “AffiloJetpack Case Study” category on this site – over the coming weeks I will be building a site from scratch using the resources provided in my AffiloJetpack membership. Will you make any profit/income? At its most basic, AffiloJetpack 2.0 is a “done for you” content product that is designed to help you get profitable affiliate websites up and running as quickly as possible. Designed and overseen by famous affiliate superstar Mark Ling, this is the second version of AffiloJetpack (the first having been released back in 2010). 1. Promote products in a niche with proven profitability, and ensure the products themselves are going to sell. 2. Build a website based around long-tail keywords in that niche. 4. Offer a free giveaway, such as an eBook, in exchange for getting people on to your newsletter list. 5. Drive traffic to your website through SEO, PPC, social media, word of mouth etc. 6. Watch your list grow … as well as your profits. AffiloJetpack 2.0 aims to provide you with everything you need to build a site that fulfils those steps. Basically, it’s all about doing the “grunt work” for you, so that you can focus on promoting your site and getting traffic, leads, and sales. How Is AffiloJetpack 2.0 Different To 1.0? If you’ve already purchased the original version of AffiloJetpack (it’s been out for a while now, having been released in 2010) then you might be wondering if there are any differences to look out for. More niches to choose from – I won’t reveal them here beyond one that I’m working on at the moment; the survival/prepping niche. There is a really diverse selection of niches on offer, so you’re bound to find something that suits your interests and skill level. Ability to automatically import and set up a lot of the site content and email newsletters. 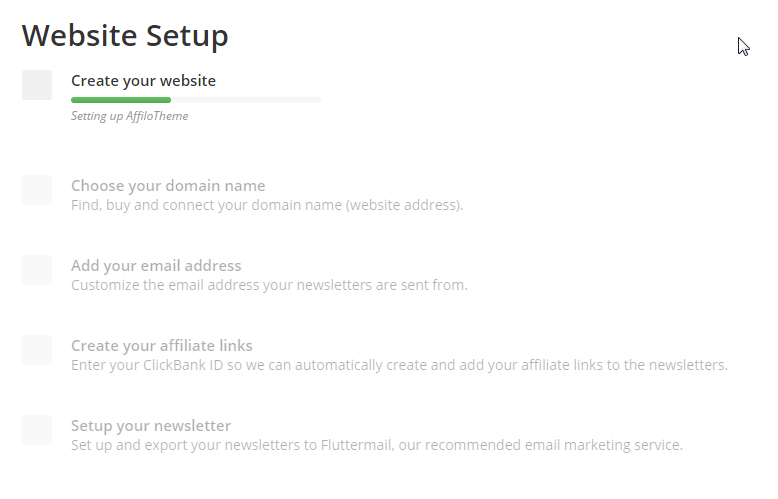 So basically you just put in your Clickbank ID and domain name and you’ll get a site and newsletters set up ready-to-go (downside is that you will be locked into paying for Fluttermail, which is not as good as Aweber). Instead of getting pre-written articles, each niche now comes with what are called “article snippets”. Basically, these are just bits of done-for-you research on relevant niche topics that will save you time when writing unique content. The point here is to cut down on the number of people who were simply copying and pasting the articles verbatim from the old version of Jetpack (this was a BIG problem). However, I’m not the biggest fan of this approach as I believe article research is an easy process. Perhaps Affilorama could have provided a $50 iWriter voucher or similar so that you could get a couple of totally unique starter articles. Different bonus products; I’m not really big on bonuses but if this is an important consideration for you then you might be very happy. You get to pick five Jetpacks out of the available 18 niches. Hundreds of professionally-researched keywords per niche, with SEO and PPC difficulty scores etc. ~90 email newsletters in each niche, with product promotions written in by an expert team. 3 x free giveaway reports/eBooks in each niche. These are roughly 10k words each, and are to be used as “bait” to entice people to sign up to your list. AffiloTheme – the bundled premium WordPress theme. ~20 content research snippets/cheat sheets in each Jetpack. You can use these as inspiration for creating your own content, or to make outsourcing easier and faster. Website hosting for your sites. Done for you website set up. This is one of the coolest parts – you can go through a few clicks and have hosting, domain, and theme installed ready to go … along with your newsletters with affiliate links embedded. You also get some training included. Bonus traffic generation strategies guide. Once again, I will explain this using a list-style format as it’s easier to understand that way. Here’s where the fun begins. The new 2.0 version of AffiloJetpack basically allows you to automatically set up an empty website ready for your content, as well as your newsletters full of affiliate links. (Optional) You can actually pick to download all the content and set up the site yourself. This is perfect if you would rather use another site building platform such as Weebly, or if you already have your own autoresponder account. From here it’s up to you to add content – basing content ideas and keywords off the bundled research articles and keyword spreadsheets. You can also get content outsourced through “recommended writers” who have been vetted by the Affilorama team to provide quality service and well-written articles. Now it’s time to promote. The aim here is to get visitors to your site via SEO/organic traffic, PPC, social media, or any other traffic generation you can think of. 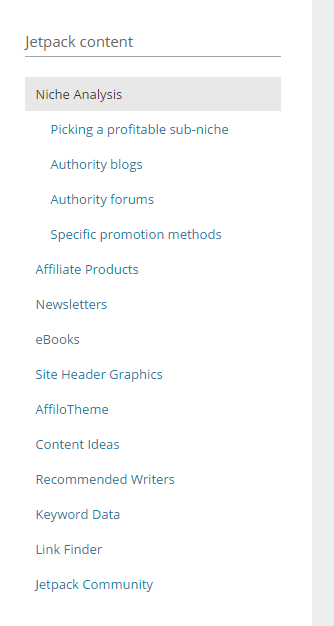 As you can see, the primary focus of AffiloJetpack is getting you set up to add content and promote your site. The site setup, niche research, and newsletter writing phase is often the most tedious part of any affiliate marketing endeavor … but AffiloJetpack does it all for you. Ahh … this perennial question that is always asked of any affiliate/Internet marketing product (and probably because it’s the most important one by far!). Whether you make any profit or income from using AffiloJetpack 2.0 is entirely up to the amount of effort you put in. If you set up a site (or sites) but never add any useful content that will encourage search rankings or inbound links, then you won’t make sales. If you create a site, add fresh and unique content, but never do any promotion, then you won’t make sales. If you don’t experiment with “outside of the box” thinking to drive more traffic and leads, then you won’t make as much money as you could be doing. However, if you’re willing to put the time and energy in to setting up your site(s) correctly, AND you’re willing to create or outsource good content AND you’re happy to put in promotional effort (i.e. link building, paid traffic/PPC, social media marketing) then you will make money. The formula is proven – it’s just up to you to get it right. If you want to do as well as possible with AffiloJetpack 2.0, then you also need to think outside the box. Sure, the product provides a very stable blueprint – build a site, add content, get traffic, drive newsletter opt-ins, promote products, rinse and repeat – but if you’re able to think a bit differently, then you might find a whole lot more potential on offer. For example, I’ve started building a Jetpack site that is basically a squeeze page giving away a free report, using Unbounce.com. I’m using Facebook ads to drive traffic to that squeeze page, and then getting subscribers in exchange for the report. Right now I’m averaging around 60 cents per lead, and aiming to go below 50. From there I’m sending follow up content, with affiliate links included. Once my list is big enough (~1000 subscribers) I’m going to launch a proper website on that topic and use my list to help grow the blog’s audience naturally. The auto-site configuration and newsletter export. I did some quick maths on this. You get 90 emails, spread out to form a year-long sequence, in each Jetpack. If you had to configure this manually by copying and pasting each article in, and adding your affiliate links, I reckon it would take 15 minutes per email. 15 minutes per email times 90 emails equals 1350 minutes … or 22.5 hours. Well-written emails with good promos. At the heart of the AffiloJetpack 2.0 system lies the humble newsletter email sequence, which is sent out to your readers via an autoresponder, and is all about “warming up” your audience to get them to convert into buyers. The newsletter sequences in the niches I have looked at so far are really great. There is a wealth of useful content and valuable advice that your readers will appreciate, and the sequences never feel too promotional. If I do have a complaint, it’s that the emails are too long and not formatted well for skim-reading. Superb support. If there’s one thing Affilorama does better than anybody else, it’s their customer support. From the lively members-only AffiloJetpack forum (where Mark Ling and other key staff actively get involved and respond to site review requests, technical problems etc) through to the fast response support ticket system, you’re never far from getting help and advice. The extra touches. There’s a bunch of handy extras that come with AffiloJetpack 2.0 that make it feel like a very classy, well-finished product. Some of my favorites include the great user experience and design of the members’ area, the niche-specific forums (where you can find link exchange and joint venture partners) as well as the flexibility to use the product how you see fit; e.g. you aren’t locked in to building your site on Affilorama’s chosen platform as you can download all the content yourself. You can’t auto-export newsletters to your own provider. The ability to export newsletters to Fluttermail automatically (with your affiliate links inside) is perhaps one of the coolest functionalities I have ever seen in any affiliate marketing product. However, it’s a double edged sword: Because the whole system has been built to work with Fluttermail, it’s a bit of a pain to manually set up your newsletters with another provider such as Aweber. It’s expensive. This is an obvious downside – at $997 it’s a serious investment. If you don’t have that kind of money to spend, then don’t purchase it … as simple as that. However, do bear in mind there is a very watertight guarantee, and Mark Ling is also offering $100 cash back on top of the refund IF you follow his included training and don’t make any money. Risk of saturation. This is the biggest problem with AffiloJetpack in my opinion. Because it’s a popular product and has a number of members (I’m guessing there would be at least 1000 by now since launch) there is a risk of the niches becoming over-saturated. This was a real problem with the original version of the product, where people were simply copying and pasting the articles verbatim onto their websites, not deploying custom themes, not changing eBook titles and covers etc. I’m guessing this saturation will rear its ugly head again with the new version of AffiloJetpack, as plenty of people will just opt to take a lazy approach to their marketing, How can you get around this? The most important strategy is to think outside of the box. For example, you might just set up a single massive article on your site, which gets links and traffic naturally or via outreach. You would then use this to promote a squeeze page or newsletter opt in box. Using a custom theme and site design – even if it means losing the benefits of AffiloTheme regarding the affiliate link setup in your newsletter sequence. Giving the free eBooks/reports new titles, fresh content, and even outsourcing some unique covers so readers don’t feel like they’re getting something stale. Ensuring your content is 100% unique and high quality. Build up social accounts and relationships in your niche in order to gain authority. How much does the product cost? The cost of access is $997 USD. Pretty steep huh!? You can pay via credit card or Paypal, with payment being securely processed by Clickbank. Is there a recurring membership cost/fee? No. However, if you choose to join Affilorama Premium/AffiloTools down the track, then be aware that there is a cost for that. How do I get more Jetpacks? You get to pick five Jetpacks when you first purchase the product (so that’s roughly $200 per site for all the emails, eBooks, research, graphics etc). You can then purchase “booster packs” for an additional sum – I’m not sure what it is however – which allow you to pick more. What niches are covered in the product? I’m not going to reveal all of the niches here, but you’ll find some “perennial” favorites such as dog training and weight loss, through to alternative energy and even Hawaii Travel. There are 18 niches in total. Will I only be promoting Clickbank products? No – depending on the niche there are affiliate products selected from other merchants such as Shareasale. However, many of these programs require you to apply before you can promote. This is more the case in “advanced” niches with higher competition. Most of the niches feature plenty of great Clickbank products that you can promote with a fresh website. So, here’s the moment of truth – should you buy the new AffiloJetpack 2.0 course? If you have the money to spare (i.e. you’re not going to max out your credit card and live off frozen veges and instant noodles for the next 6 months to pay for it) and you’re interested in creating more “traditional” type affiliate sites, then AffiloJetpack is a great option. I truly do believe it is the best Internet marketing product in the world from a value perspective. This is because you get all the pre-written emails, valuable eBooks to give away for list building, and pre-selected affiliate products – a massive time saver. The done-for-you research is also very handy when it comes to putting unique articles together (which is important as one of the biggest downsides to AffiloJetpack has always been “burnout” as I described above). What makes the product even better is the way it can be configured to do most of the boring stuff for you. From setting up your WordPress site and registering a domain, through to importing your newsletter sequence automatically into Fluttermail … with ALL your affiliate links in the newsletters. All this time saving that AffiloJetpack brings really does add up (I estimate you’ll save around 20-30 hours per site) and allows you get into the game as quickly as possible. However, if you’re struggling for cash and need to see some results from your affiliate marketing first, then I recommend you look elsewhere. Regardless of the amount of content on offer, it’s still going to take you a minimum of a few months to get an AffiloJetpack site paying back. Just start with something simple like picking a niche and affiliate product, and then making a YouTube video each day that is targeted to a long-tail keyword (find them using the AffiloTools free trial) will eventually result in some affiliate sales if you’re consistent. This won’t cost you much money as well if you make use of a free screen capture software trial – something like Camtasia will do the trick. If you don’t want to go down the video marketing route, then any other form of “parasite paging” will work just as well. Look for sites that are ranking well where YOU can create content – Slideshare, Scribd, Buzzfeed etc – and then promote that route. So to recap again: If you can definitely afford the purchase price and now enough about affiliate marketing/Internet marketing to have a good crack at building the sites, then AffiloJetpack 2.0 is right for you. If you can answer “yes” to those four points above, then AffiloJetpack 2.0 is the right product for you. However, if you can’t, then you might want to look at ramping up with a free method or starting with something more step-by-step, such as the AffiloBlueprint 3.0 course. If you do decide to purchase AffiloJetpack 2.0, then I would really appreciate if you do so here (through my affiliate link). It won’t cost you anything extra to buy, and you can support me to continue writing honest reviews of Internet marketing products – just compare this review to some of the others out there; I’ve been totally up front with the good and bad about AffilioJetpack. Anyway, I digress. If you buy AffiloJetpack 2.0 through my affiliate link, then I’ll provide you with a very cool bonus. I will give you a full on-page SEO audit of your first Jetpack site, as well as create a detailed outreach link building plan that is tailor-made for your niche. I will give you an outline for a killer content piece for your website, as well as at least 20 websites you can outreach to AND a pre-written email template to use. You will also get my personal email address, so you can ask me as many affiliate marketing/SEO/traffic generation questions as you want. 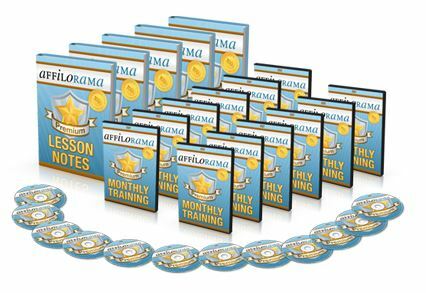 Other people are offering the usual smattering of PLR eBooks, outdated video courses etc. But I genuinely believe that AffiloJetpack is a great product, and I’m willing to put my time on the line to help you to succeed with it. To get my bonus simply buy through my affiliate link, keep a note of your Clickbank transaction/receipt number, and then email it to sam @ internet-marketing-training-for-newbies.info – remove the spaces first! So if you think you’d like to give AffiloJetpack 2.0 a try (bearing in mind everything I’ve told you in this review) then go here to get your access. Remember, you aren’t going to become a millionaire overnight, but with effort and dedication you can make the most of what AffiloJetpack offers and have a shot at success.